"If you need a watch, that simply tells the time, our products are not for you" - say the members of Tokyo Flash company. 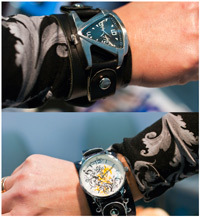 The watches by Tokyo Flash, the Japanese watch company, are the “eccentric" accessories. At the first sight, it is difficult to recognize the watch in this strange object, and it seems altogether absurd to determine the time. All watches belong to the "fashion" style. These electronic gadgets are prefered by the designers, engineers, IT managers and just fans of different puzzles. There are no dials and hands on these watches. The periods of time are observed by the diodes, displays, and matrixes. It is very difficult to buy Tokyo Flash watch even in Japan, because they are not mass-produced. You can place your order on the official website of the company. In 2004, Pimp One, the first LED watch, was released in the limited edition of 250 timepieces. It was the special edition, issued as a gifts for some clients of Tokyo Flash. At that time, the company produced custom-made cars, it was involved in the motorcycles and cars tuning, and equipped the nightclubs in the hi-tech and techno styles. Some time later, Tokyo Flash decided to launch a company, producing the unusual wrist watches. The company has more than 70 developments and inventions in the sphere of horology to its credit. Tokyo Flash watches are released in the limited edition of 500 - 3,000 items per year. After the release of a particular model, the company begins to develop a new design. 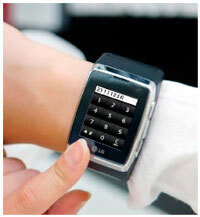 In Russia, just about 350 Tokyo Flash watches of total production are sold. 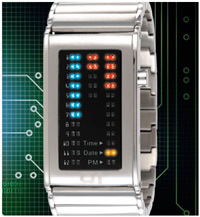 Tokyo Flash collections consist of bright LED watches, Dot Matrix watches, the watches with the disks instead of hands. The cases are of different shapes and colours, made of stainless steel, durable plastic, brass, the straps are produced from polyurethane. The watches can be charged either with the computer or with any charging device, that has the USB connector.